Welcome to Breitbart News’s live updates of the 2016 election. 10:17: Weld answers “Monkey Business” when asked what he would title a novel based on the 2016 election. 10:11: The candidates get a question about the libertarian movement supports the “Black Lives Matter”movement. Weld, sounding like a Boston Brahmin, says he is a pluralist and his wife read from the Quran to various groups that make up the diaspora. Speaks about various “diversity” initiatives he instituted as governor. Johnson says we’d like to bring an end to the drug war. Both candidates seem out of touch with the questioner. 9:55: Johnson says he’s tired of the two-party system and it wouldn’t bother him if he hurt either Trump or Clinton in the general election. On taxes, he says he if he could waive a magic want, he would eliminate the income tax and corporate tax and abolish the IRS. He would then institute a consumption tax. He says 80% of the lobbyists would go away if these taxes were eliminated. 9:45: Johnson talks about various grades of heroin and says marijuana should be legal but heroin should not. A woman whose son is in a wheelchair and was permanently disabled due to a heroin overdose has been challenging Johnson on his past statement re: legalizing all drugs. Johnson says that prohibition does more harm than good. 9:35: When Johnson asks whom he would pick if he had to choose between Trump and Clinton, he says he knows there will “always be a libertarian choice” on the ballot and punts. When pressed, Johnson says he’s not going to give in to voting for one or the other. Weld definitely answers “Mrs. Clinton” and insists that Clinton is well qualified to be president while Trump is not. 9:33: Johnson says Trump’s desire to build a fence and deport illegal immigrants is “incendiary.” He says wanting a border wall is “insane.” Johnson says illegal immigrants “aren’t taking jobs that U.S. citizens want.” Weld now takes the opportunity to slam Trump’s foreign policy. Weld invokes Anne Frank in doubling down on his previous comments where he compared Trump’s immigration policy to Nazi Germany. Johnson wants to make it as easy as possible for people to get work visas so the line keeps moving. 9:32: Johnson says he doesn’t go to church, and he says the God that he speaks to doesn’t have a particular religion. 9:30: Questioner asks what the federal government’s role to ensure a woman’s right to choose in every state. Johnson says the law of the land is the woman has a right to have an abortion up to the viability of the fetus. He says we’re not looking to change the law of the land in any way. Johnson says Planned Parenthood “does a lot of good” and Republicans alienate voters when they talk about defunding it. 9:25: Debate now turns to health care. Johnson says there should be some “safety net” in the states and says he hasn’t seen a doctor in three years. He says he favors a free-market approach to health care. He says we would have insurance for catastrophic situations and not ongoing medicare care. Johnson says we have no idea what it’s going to cost to go to doctor and what the outcome will be. He says there will be “dramatic savings” if there is a free-market approach to healthcare. 9:19: Johnson says you shouldn’t close off the debate on more gun control. He says that “automatic weapons” have been illegal in the United States. Weld says ISIS should be treated like a “gigantic organized crime family.” Johnson says the no-fly lists are subject to error and doesn’t agree with the sit-in that is taking place right now in the House. Cuomo, taking the liberal line on gun control, tries to make the case that there is “due process” for people on no-fly list. Johnson keeps pointing out that the lists are subject to error that can impact people’s lives. 9:12: And there you have it. LIBERTARIAN CANDIDATES PRAISE CLINTON, SLAM TRUMP ON CNN. 9:02: When asked to introduce himself, Johnson notes he is an athlete and a former governor. He says a “libertarian” is fiscally conservative, socially accepting and non-interventionist. He points out that being a non-interventionist does not mean one is an isolationist. Weld says they want government out of people’s pocketbooks and bedrooms. 9:00: CNN is hosting a libertarian town hall with former New Mexico Gov. Gary Johnson and former Massachusetts Gov. Bill Weld. 6:50: Former Mexican President Vicente Fox Tweets “Never Trump.” The “Never Trump” movement is doing as badly as Mexico’s soccer team did against Chile. 6:34: “Never Trump” political professionals need to stay on the gravy train. For some this election cycle, that means making ads (and getting the commissions from them) targeting delegates to try to unbind them. 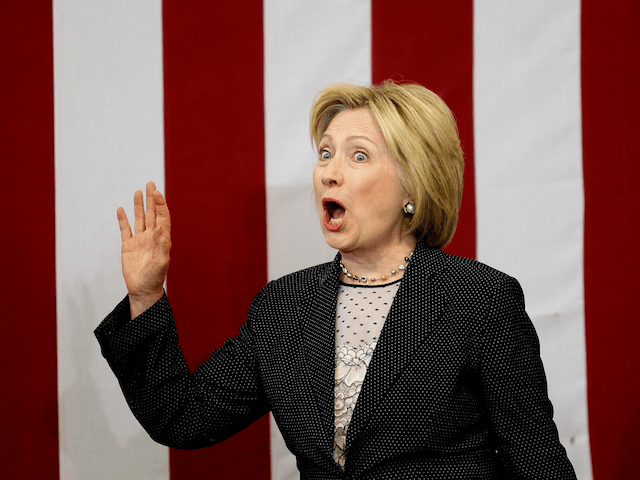 6:32: The Associated Press or Clinton’s rapid response operation? Is there a difference? Clinton has claimed that Obama didn’t go far enough with his executive amnesty. 6:23: Report: Trump planning whip operation to keep delegates in line at convention. 6:15: On CNN, milquetoast Paul Ryan says he hasn’t heard or read Trump’s speech. He says he has been told by a number of his colleagues that he gave a “very good speech.” When pressed on Trump’s opposition to the TPP, Ryan says the TPP still has “promise” and hopes the agreement can be changed into a “world-class” agreement. CNN’s Blitzer, now putting on the Dem. uniform since it’s the general election, doing his best to use Ryan as the useful tool to make Trump seem “extreme” asks Ryan if he “totally disagrees” with Trump on building a wall, deporting illegal immigrants, and instituting a temporary ban on Muslim immigrants. Ryan says he has “no plans” to host fundraisers for Trump’s presidential campaign. Ryan, while undermining Trump’s general election chances, says Clinton can’t be elected because Republicans will lose the Supreme Court for a generation. Ryan talks about his “Better Way” agenda, not realizing that almost everyone outside of the Beltway has no idea what’s in it. Ryan says “it depends on the issue” when asked if he trust Trump. 5:59: Media can’t wait to “fact check” every utterance Trump makes. Clinton, unlike Trump, is given the benefit of the doubt. The media think all of her statements are true until proven otherwise. They think all of Trump’s statements are false until proven to be correct. 5:57: The “Never Trump” movement seeming like the last gasp of Beltway pipsqueaks trying desperately to cling to any relevance they ever had. 5:50: Rumsfeld declares support for Trump. 5:45: Trump campaign still doesn’t have its act together. Yesterday’s fundraising email was a mistake? 5:30: Clinton email troubles: security features were disabled on her server while her top ID aide invokes the 5th 125+ times during deposition. While Clinton spoke in NC, former Bush 41 National Security Adviser Brent Scowcroft endorsed for president. 3:36: On CNN, Rubio says he is running for the Senate to keep the next president in check. CNN’s Manu Raju does a great job pushing Rubio on his Gang of Eight bill, his missed votes in the Senate. He calls him out when Rubio says if he was intending to run in 2020, which means he is assuming the GOP will lose in 2016 (? ), he would not be running for reelection. Rubio, though, doesn’t rule out a 20/20 bid and sounds like the typical politician who always talks out of both sides of his mouth. Why else would Rubio be running? He needs a “title” for a future presidential run. Stop insulting the intelligence of regular people with these answers crafted by Beltway consultants. That’s why Rubio never caught on in the primary campaign where voters wanted an outsider. 3:12: Clinton says Trump is threatened when his hollowness is called out. She says her speech yesterday must have gotten under his skin and claims Trump has attacked her and her faith because he wants to distract Americans since he has a lack of substance. 3:10: Clinton hasn’t responded to Trump’s remarks about her corruption. 2:52: Clinton says not every good job requires a four-year college degrees. She supports apprenticeship programs where people can “earn” while they “learn.” After railing against “wage theft,” Clinton says she supports an “exit tax” on corporations that try to move overseas. 2:50: Clinton mentions that black unemployment is twice as high as it was in the 1990s, but she doesn’t mention her support for amnesty legislation and the possible impact that may have or that it went up during Obama’s presidency. Clinton says she doesn’t support the Trans-Pacific Partnership, but she says it without much enthusiasm. 2:45: Clinton is making the Dem. argument that comprehensive amnesty legislation will be “smart” for our economy. Trump made the argument that Clinton can’t argue that she’s a friend of minority communities and working Americans when she is advocating for policies that will bring in massive numbers of workers who will take their jobs or lower their wages. Clinton shifts to “breaking the down the barriers” of “systemic racism” that are holding people back from fully participating in our economy. 2:40: Clinton now talks about five ambitious goals the federal government should adopt after saying economic benefits should be more “fairly distributed.” She speaks about making “college debt free for all.” She is now talking about the need for investments at home, something Trump has spoken about since the beginning when he has discussed America’s third-world airports and roads. Clinton wants to “build better” and connect every household to broadband by 2020. She wants a “cleaner and more resilient” power grid. She then advocates raising the national minimum wage. 2:38: While Trump made specific attacks against Clinton, Clinton is attacking corporations and making the same Dem. arguments against generic Republicans. That may work against generic, robotic candidates like Paul Ryan, but it is not likely to stick to Trump. 2:30: Clinton says it’s not an understatement to say Americans face a choice in November. She robotically slams Trump for spewing “reckless ideas.” Clinton says she’s here to offer an “alternative.” She says we need to make sure our economy works for everyone [Trump has a compelling case, though, that her immigration policies and past support for globalist trade deals have devastated the economy.]. Clinton now talking about her poll-tested five-step plan for growth. 2:28: Clinton says she has “double the grandmother clothes” and she says you don’t have to be a granddaughter of a Secretary of State to have every opportunity available in the country (sounding a bit like John Edwards in North Carolina). Clinton will use part of her speech in North Carolina today to respond to Trump's NY speech, per an aide. 12:23: Do voters vote on someone’s command of policy minutiae?
. @BernieSanders says on @cspan that @HillaryClinton's command of public policy is in a "different world" from where @realDonaldTrump is. "It doesn’t appear that I’m gonna be the nominee," @BernieSanders says on @cspan when asked if he will speak at the convention. Tony Lee: Trump needed to give this speech in front of a packed crowd in a city that has been devastated by bad trade deals. Second, Trump took a step forward but needs to keep improving as a candidate. Today, he often sounded like a Congressman at a hearing reading something that was written for him by career staffers. It didn’t feel like he viscerally owned the speech and its themes, which is something he needs to get down before the general public starts paying attention to the general election in a month. Third, Trump’s speeches never have a thread that binds everything together. Trump needs to show some vulnerability and talk about how he was underestimated and dismissed when he tried to get into New York’s real estate market from Brooklyn. He needs to then talk about some of his setbacks and then argue that America/Americans can roar back like he did. 11:37: The elite media tip their hand re: what may resonate with voters by their apoplectic reactions. David Gergen on CNN says Trump’s use of Clinton Cash to attack Clinton was “slanderous.” That overreaction tells you that Gergen knows those attacks may well stick in the general election. 11:35: CNN’s Margaret Hoover, one of the network’s establishment GOP pundits, shows how clueless she is when he says Paul Ryan may have hijacked Trump’s Teleprompter when speaking about Trump’s comments to revitalize the inner cities. There’s a huge difference. Trump is vowing to end amnesty and curb illegal immigration in order to help those in the inner cities get better jobs. He is vowing to make better trade deals to bring jobs back to the inner cities. He said he wants to use the funds dedicated to admitting more Syrian refugees to revitalize the inner cities. Paul Ryan’s “better way” plan for the inner cities is just a bunch of gobblyedgook from a person who has spent his whole life in the politics and still speaks like a career staffer adept at giving power point presentation. 11:28: Trump also vows to support our police and law enforcement because we can’t ever forget the “great job they do.” He also promises to appoint “great Supreme Court Justices.” Trump says parents will start dreaming big for their children again, including parents in our inner cities, when he becomes president. He says Americans are going to start believing in the future of our country and vows to make America “rich” and “safe” again. 11:25: Trump talks about bringing America back. He says massive factories will come back. Inner cities will be rebuilt. He says construction is what he knows and wages will be going up along with “new jobs, jobs, jobs.” Trump says Clinton’s open-borders policies will drive down wages and get rid of even more jobs. 11:18: Trump reads a letter from a mother whose child was murdered by an illegal immigrant. Trump says Mrs. Mendoza wrote that “Hillary Clinton, who already has the blood of so many on her hands, is now announcing that she is willing to put each and every one of our lives in harms way. An open-door policy to criminals and terrorists to enter our country. Hillary is not concerned about you or I.” Mendoza believes Clinton needs to go to prison to pay for the crimes against our country. Trump adds that we could rebuild every inner city in America with the amount of money she intends to spend on admitting Muslim refugees. 11:17: Trump says immigration policy “national security is also immigration security and Hillary wants neither.” Trump says Clinton has put forward the “most radical” immigration platform in the history of the United States. He says Clinton wants massive amnesty and complete “open borders” due to lack of enforcement of immigration laws. He says the first victims of her radical policies will be poor African-American and Hispanic workers who need jobs. 11:15: Trump says America’s enemies probably have a “blackmail file” on Clinton, and that is why we can’t elect her to be president. Trump says her “deepest, darkest secrets” are probably in the hands of our enemies because her private server was probably hacked. 11:12: Trump, again citing Clinton Cash, points out that Clinton gave approval to transferring 20% of our Uranium to Russia for $125 million in donations to her Clinton Foundation. Trump also points out that Clinton took millions from countries that oppress women and gays and suggests she set up a private server to conceal her private dealings. 11:03: Trump says Clinton’s foreign policy has “unleashed ISIS across the world.” Trump says Ambassador Stevens was left to die while Clinton was sleeping. Trump then blasts Clinton for lying about Benghazi. Trump says “it was a different world” before Clinton was sworn in and then “in four years, Sec. Clinton almost singlehandedly destabilized the entire Middle East.” Trump says thanks to Clinton, Iran is now the dominant power in the Middle East and on the road to nuclear weapons. 10:59: Trump says Clinton’s performance as Secretary of State was “disgraceful.” He also says China has taken billions and billions of dollars of our intellectual property while Clinton gave China our best jobs. Trump mentions Breitbart News Senior Editor-at-Large Peter Schweitzer’s Clinton Cash book and says Clinton gets rich while making you poor. Trump says Clinton “sold out” our country to Beijing and points out that Clinton has been one of the top proponents of the Trans-Pacific Partnership. Trump says that Clinton is pretending to be against the deal and mention that she deleted a section from her book where she effusively supports the deal. Trump says that the government could find Clinton’s emails if it really wanted to. Trump says if Clinton is elected, she will adopt the Trans-Pacific Partnership and we will lose our “economic independence for good.” He says TPP will be worse than NAFTA. Trump says he wants trade deals that are great for the country and workers. 10:57: Trump says “we have to make America rich again.” Trump says our country will be great again when we start making its own products again and bring back its manufacturing base. Trump points out that one of the major bills that George Washington signed dealt with the encouragement and protection of manufacturing jobs. Trump also quotes Lincoln re: protecting the country’s manufacturing base. 10:55: Trump says the special interests “own” clinton. Trump says Clinton doesn’t have the “temperament” or the “judgment” to be president. 10:53: Trump says this election will decide whether we’re ruled by the people or the politicians. Trump promises to end the special interest monopoly in D.C. Trump says Clinton has “perfected the politics of personal profit and even theft.” He says Clinton ran the State Department like a “personal hedge fund” while doing favors for oppressive regimes in exchange for cash. 10:52: Trump, now defending his businesses, says he started off in Brooklyn with a “small” loan and now has an empire worth $10 billion. Trump says he is running for president to end the unfairness and put the American worker first. “We’re going to put America First, and we’re going to make America great again,” Trump says. 10:50: Trump calls Clinton a “world class liar.” Trump attacks Clinton for her “phony landing in Bosnia.” He says Brian Williams’s career was destroyed for saying much less. 10:48: Trump says we can’t fix a rigged system by counting on the same insiders who rigged it in the first place. Trump asks Sanders’s supporters to join his movement so “we can fix the system” together. “This includes fixing all of our disastrous trade deals,” Trump says. Trump says the “whole economy” is rigged in addition to the political system. 10:45: In New York (why is he not in a swing state like Ohio or at least Florida? ), Trump says he is running for president to give back to the country that has been “so very good to me.” Trump says only he can fix the country’s problems like its crumbling infrastructure and bad trade policies. 10:02: CNN’s Manu Raju is reporting that Rubio will run for reelection in the Senate. The move makes him seem like a typical politician. I have only said like 10000 times I will be a private citizen in January.